Home > Free > Playtex & Schick Deals at Rite Aid = Possible Money Maker! Playtex & Schick Deals at Rite Aid = Possible Money Maker! 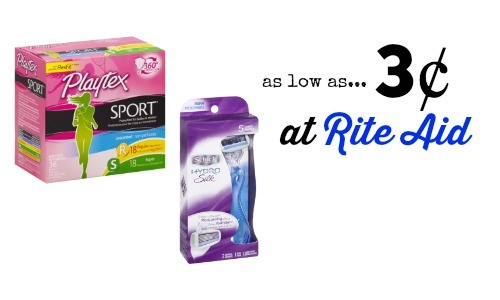 Want to grab super cheap feminine products and razors? Head to Rite Aid this week to pair together store coupons, manufacturer coupons and store rewards. In the end you’ll possibly get it all for FREE! There were $3 off and $4 off store coupons in the weekly Rite Aid ad (just grab one when you get to the store), but they didn’t mention in the ad that there is also a +UP deal running on these items! Buy 2 participating items and you get a $3 +UP reward back. If you have hit silver status your 10% off will also apply (or 20% off for Gold levels) because these items aren’t technically on sale! So for many of you this deal is even better!! Silver shoppers pay 59¢ ea. or Gold shoppers make 61¢ to buy both items!! That makes it $2.29 each! Silver shoppers will get them for $1.61 ea. and Gold folks will pay 3¢ ea.!! Note: There is a limit of $6+UP total from this deal across all participating items. Sale ends 10/11.